Within the team tab, click "edit" next to the team name to enter its team settings. Here, you can change find email, users, billing and team deletion details. Within the team settings, under the "Users" tab, the users that on the team are listed. By clicking the "+" button at the bottom right corner, you can invite members to the team with or without admin status. If you would like to remove a member from a team, within the team settings, simply go to the "Users" tab, click the '..." next to the member name and then click "delete." Please note: Any additional members on the team increase the cost to the admin's team billing. 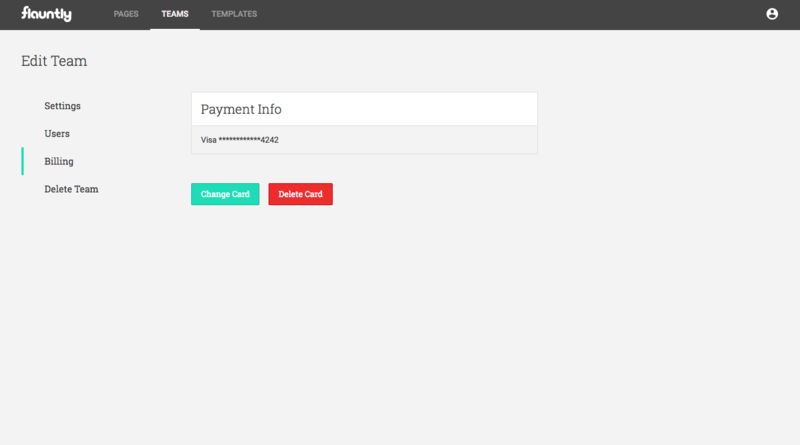 The team's payment info can be found within the team settings and under the "Billing" tab. You may change the credit card on file for payment freely without interruptions. Not having a card on file or the decline of payment at the time of renewal will revoke that team's plan capabilities. Please note, a team plan that does not have an active premium plan will be unable to make changes to pages within the team or the team settings. Only adding a credit card for payment will be allowed. To delete a team, go into the team's settings and under the "Delete Team" tab, click the "Delete Team" button. You will be prompted to confirm the deletion. The team's card information is permanently deleted and must be reentered if you undelete the team while in its pending state. Please note, the deletion of the team immediately disables the team and makes all pages unavailable while in the pending state of deletion (pending for seven days). Undeleting a team starts a new premium plan for that team and all pages and settings will be re-enabled. If you have any specific questions regarding premium plans, please see our Free & Premium Plans tutorial. For any additional questions, take a look at our FAQ and Guides for help. For customer support, please feel free to contact us.